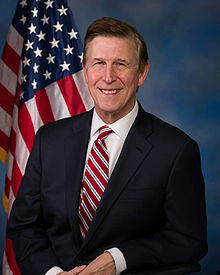 Donald Sternoff (Don) Beyer, Jr. (born June 20, 1950) is an American businessman, diplomat and Democratic Party politician who has served as the United States Representative for Virginia's 8th congressional district since 2015. Beyer owns automobile dealerships in Virginia, and has a long record of involvement in community, political and philanthropic work. From 1990 to 1998 he served as the 36th Lieutenant Governor of Virginia during the gubernatorial administrations of Democrat Doug Wilder (1990–1994) and Republican George Allen (1994–1998). His party's nominee for Governor in 1997, he lost to Republican Jim Gilmore, the Attorney General of Virginia. From 2009 to 2013, he served as United States Ambassador to Switzerland and Liechtenstein. In 2014, Beyer announced his candidacy for the U.S. House of Representatives seat for Virginia's 8th congressional district held by the retiring James Moran. Beyer won the June 2014 Democratic primary with 45% of the vote, and defeated Republican Micah Edmond 63% to 33% on November 4, 2014. Beyer earned his bachelor’s degree in economics from Williams College. He owns automobile dealerships throughout Northern Virginia. He was elected Lieutenant Governor and President of the Senate of Virginia in 1989, on the same ballot as Governor Douglas Wilder. Since an unsuccessful run for governor, Beyer has served in volunteer roles in the campaigns of other significant American political figures. In 2007-2008 he served as Mid-Atlantic Finance Chair for Senator Barack Obama. In 2006, he was Finance Chair for Governor Mark Warner’s exploratory presidential bid. In 2003-2004, he was Treasurer for Dean for America. Later in 2004, Beyer served as Virginia Chair of Kerry Edwards Victory ’04. Beyer chaired the Virginia presidential campaigns of Bill Clinton in 1992, and of Senator Paul Simon in 1987-1988. On February 26 1990 Student Environmental Action Coalition activists rallied outside the Virginia state capitol in Richmond. Ed Clark from the Wildlife Center of Virginia Center spoke, as did Lon Maxifield from Fossil Fuels Action. Lt. Governor Don Beyer also attended and was presented with a dogwood tree from SEAC . Beyer was Howard Dean’s national finance chair in 2004. In June 2009 Don Beyer was nominatedby the Obama administration for the position of Chief of Mission, Swiss Confederation in the DOS and confirmed in July 2009. Beyer is a strong supporter of the US-Israel partnership and understands that a two-state solution is crucial to Israel’s survival.. In January 2015, Don Beyer was listed as a new member, of the Congressional Progressive Caucus. Don Beyer is a former Center for Arms Control and Non-Proliferation board member. The Council for a Livable World, founded in 1962 by long-time socialist activist and alleged Soviet agent, Leo Szilard, is a non-profit advocacy organization that seeks to "reduce the danger of nuclear weapons and increase national security", primarily through supporting progressive, congressional candidates who support their policies. The Council supported Don Beyer in his successful 2014 House of Representatives run as candidate for Virginia. This year, he voted to reduced funding for the nuclear cruise missile, to block the Overseas Contingency Operations fund from being used as a slush fund, and to require a new Authorization to Use Military Force if the President wants to keep fighting in Iraq and Syria. Claudia Bonilla was an Intern at Don Beyer's Campaign for Congress, May 2014 – Jul 2014. The group was accompanied by Sarah Stephens of Center for Democracy in the Americas. At the The National Rural Electric Cooperative Association (NRECA) 4301 Wilson Blvd, Arlington, VA.
Cosponsors: Alexandria, Manassas and Manassas Park Democratic Committees; Democratic Asian Americans of Virginia; Democratic Latino Organization of Virginia; George Mason University College Democrats, AFL-CIO Virginia, SEIU Virginia 512, Progressive Democrats of America-Virginia; People Demanding Action-Virginia; NOVA Move-to-Amend; New Virginia Majority, The Brigades. Rep. Beyer has supported several radical Muslim groups and causes. Afraz Khan Policy Intern Muslim Public Affairs Council - MPAC, May 2016 – Jul 2016. Coordinated a week-long National Summit for 25 undergraduates by developing a week-long itinerary with policy workshops, scheduling group meetings with groups including Google and the Department of Justice and connecting students with Representative Andre Carson. On December 17, 2015, Rep. Don Beyer, Jr. introduced legislation condemning "violence, bigotry, and hateful rhetoric towards Muslims in the United States." The legislation is based on unsourced claims that there is a "rise of hateful and anti-Muslim speech, violence, and cultural ignorance," and a "disproportionate targeting" of "Muslim women who wear hijabs, headscarves, or other religious articles of clothing...because of their religious clothing, articles, or observances." The resolution, H.Res.569 - Condemning violence, bigotry, and hateful rhetoric towards Muslims in the United States  was cosponsored by Rep. Michael Honda, Rep. Keith Ellison, Rep. Joseph Crowley, Rep. Andre Carson, Rep. Eleanor Holmes Norton, Rep. Betty McCollum, Rep. Marcy Kaptur, Rep. Carolyn Maloney, Rep. Dan Kildee, Rep. Loretta Sanchez, Rep. Charles Rangel, Rep. Scott Peters, Rep. Brad Ashford, Rep. Alan Grayson, Rep. Mark Takai, Rep. Brian Higgins, Rep. William Keating, Rep. Raul Grijalva, Rep. Debbie Wasserman Schultz, Rep. G.K. Butterfield, Rep. Gerry Connolly, Rep. Ruben Gallego, Rep. Cheri Bustos, Rep. John Delaney, Rep. Kathy Castor, Rep. Luis Gutierrez, Rep. Michael Quigley, Rep. Elizabeth Esty, Rep. Joseph Kennedy III, Rep. Robin Kelly, Rep. Eddie Bernice Johnson, Rep. Gregory Meeks, Rep. Grace Meng, Rep. Al Green, Rep. Katherine Clark, Rep. Adam Schiff, Rep. Alcee Hastings, Rep. Sam Farr, Rep. Frank Pallone, Rep. Jim McDermott, Rep. Barbara Lee, Rep. Donna Edwards, Rep. Robert Brady, Rep. Frederica Wilson, Rep. Michael Doyle, Rep. Albio Sires, Rep. Suzan DelBene, Rep. Judy Chu, Rep. Jared Polis, Rep. David Loebsack, Rep. Bill Pascrell, Rep. Debbie Dingell, Rep. Jan Schakowsky, Rep. Steve Cohen, Rep. Ruben Hinojosa, Rep. John Yarmuth, Rep. Niki Tsongas, Rep. Jim Langevin, Rep. Mark Pocan, Rep. John Conyers, Jr., Rep. Mark Takano, Rep. Tim Ryan, Rep. Jose Serrano, Rep. Hank Johnson, Rep. Paul Tonko, Rep. Zoe Lofgren, Rep. Chris Van Hollen, Rep. Lois Capps, Rep. David Price, Rep. Doris Matsui, Rep. Gwen Moore, Rep. Denny Heck, Rep. Sheila Jackson Lee, Rep. John Carney, Rep. Xavier Becerra, Rep. Eric Swalwell, Rep. John B. Larson, Rep. Dina Titus, Rep. Peter Welch, Rep. Lloyd Doggett, Rep. Jim Himes, Rep. Matt Cartwright. Rep. Don Beyer (D-Va.) (October 2017). It was great to see so many friends tonight at the 28th Annual Virginia Arab American Political Forum! — with Congressman Don Beyer at Tysons Corner Marriott. It was great to join so many friends tonight at the 30th Annual Virginia Arab American Political Forum. I was so happy to see our wonderful Sen. Tim Kaine and Congressman Don Beyer join us. Thank you Saba for the warm welcome and to your tireless work for the community. — with Kenny Allen Boddye at Tysons Corner Marriott. Honored to receive the endorsement of Congressman Don Beyer for my candidacy for DNC Vice Chair of Civic Engagement & Voter Participation. "I'm pleased to endorse Yasmine for DNC Vice Chair of Civic Engagement & Voter Participation. Her advocacy and commitment to defending marginalized communities make it clear that in these uncertain and dangerous times, Yasmine is prepared to fight. That's what the DNC needs right now -- fierce and bold leaders who understand the challenges facing all Americans." -- Congressman Don Beyer (VA-8) — with Congressman Don Beyer. When Rep. Don Beyer (D-VA) sat down as a dinner guest in April 2016, his hosts had a clear agenda beyond sharing a meal together. Beyer’s companions were the Pintos, a Latino family of five with varying immigration statuses who live in suburban Virginia. Borrowing an immigrant advocate’s house on this night, the family passed around a take-out platter with fajita ingredients around the table of six, no cell phones in sight, eager and nervous to dine with Beyer. The dinner, sponsored by the Virginia Coalition for Immigrant Rights, allowed the Pinto family to highlight how they could contribute more to American society if the president’s executive action on immigration formally announced in November 2014 were allowed to take place. Falls Church, Virginia — According to communications people Jose Caceres, and Emily Kessel, on July 9, 2015, the day before the 5th Circuit Court of Appeals hears oral arguments on the lawsuit blocking the implementation of the deferred action programs, immigrant rights organizations in Virginia hosted a community town hall on the importance of the Deferred Action for Childhood Arrivals (DACA) and Deferred Action for Parents of U.S. Citizens and Legal Permanent Residents (DAPA) programs for immigrant families in Virginia at the Culmore United Methodist Church. The 2015 DACA/DAPA Community Town Hall facilitates a dialogue between community members and Virginia congressional offices, Virginia House of Delegates, and other civic leaders about how to best move forward to defend DAPA and DACA expansion and provide further relief for hardworking immigrant parents, young people, and their families. The event was organized by the Virginia Coalition of Latino Organizations, NAKASEC, the Virginia Coalition for Immigrant Rights, the Virginia Latina Advocacy Network , DREAMers Of Virginia, Mason DREAMers, and DREAMers Moms USA. Representatives from the offices of Senator Tim Kaine, Senator Mark Warner, Representative Don Beyer, and Representative Gerry Connolly joined the event and committed to delivering community concerns and recommendations to Congressmembers. Local organizations that aid immigrants have denounced President Trump’s executive order temporarily banning immigrants from seven Muslim-majority countries and refugees from any country. Those groups, along with elected officials, including Rep. Gerry Connolly, Rep. Don Beyer, Virginia Gov. Terry McAuliffe, and Attorney General Mark Herring, participated in a protest against Trump’s order at Dulles International Airport Jan. 28, 2017. Representative Don Beyer was part of President Barack Obama's March 2016 delegation to Cuba. After over 30 Democratic Socialists of America members packed his townhall, Representative Don Beyer agreed to co-sponsor HR 676, the Improved and Expanded Medicare for All Act. On September 17th 2017, a group of organizers with the Northern Virginia branch of the Metro DC Democratic Socialists of American attended Representative Don Beyer's (D-VA08) town hall in McLean to ask him to support H.R. 676, The Expanded and Improved Medicare for All Act. Local DSA Group Convinces Rep. Beyer to Support Medicare for All Bill, Metro D.C. DSA, Northern Virginia branch. McLean, VA-Members of the Democratic Socialists of America (DSA) from Virginia’s 8th Congressional District advocated for single-payer health care at a town hall on September 17 hosted by U.S. Rep. Don Beyer (D). Congressman Beyer had yet to co-sponsor H.R. 676, the Improved and Expanded Medicare for All Act. To encourage him to sign on, Beyer’s DSA constituents shared personal stories of how the current health-care system has failed them and their families. The local action is part of the DSA’s Medicare for All campaign. At the town hall, Congressman Beyer hedged at first. He noted that he and his staff “are committed to fixing the Affordable Care Act.” He also said that HR 676 has a few problems. “We’re waiting until Bernie’s Medicare for all bill reaches the house, and we’ll take the best of HR 676 and Bernie’s bill,” he said. In the end, however, he agreed to support HR 676. “I’ll sign off on HR 676 in the morning,” he said. Rep. John Conyers (D-MI-13), the bill’s sponsor, has introduced Medicare for All legislation in every congressional session since 2003, but it has never been more popular than now. At present the bill has 119 co-sponsors, including an overwhelming majority of the Congressional Progressive Caucus, of which Beyer is a member. Previously, the bill’s highest level of support was 93 co-sponsors under the 110th Congress, when Democrats took control of the House during the final years of the George W. Bush administration. At DSA’s 2017 convention, held last month in Chicago, delegates voted to make Medicare for All a national priority. DSA enthusiasm has exploded recently with membership more than quadrupling in the last year. The DC Metro chapter of DSA has almost 1,000 dues-paying members with many residing in Virginia’s 8th district. In August 2018 Medicare For All Congressional Caucus founding members included Representative Don Beyer.